Born in Tetyushi, Kazan province (Tataria), 1903. Studied at the Turkestan Regional Art School, Tashkent, 1920-21; at the Moscow VKhuTeMas/VKhuTeIn 1921-29. Active in Moscow. Member of RAPKh. Important shows include "ARTISTS OF THE RUSSIAN FEDERATION OVER FIFTEEN YEARS", Moscow, 1933; "All Union Art Exhibition", Moscow, 1946; "All Union Art Exhibition", Moscow, 1952. Specialised in landscapes. Best known as a member of the Kukryniksy trio of graphic artists from 1924. Became a Soviet academician 1947. Awarded Stalin Prizes 1942, 1947, 1949, 1950, 1951 (all as amember of the Kukryniksy); awarded two Orders of Lenin. Died in Moscow 1991/92? 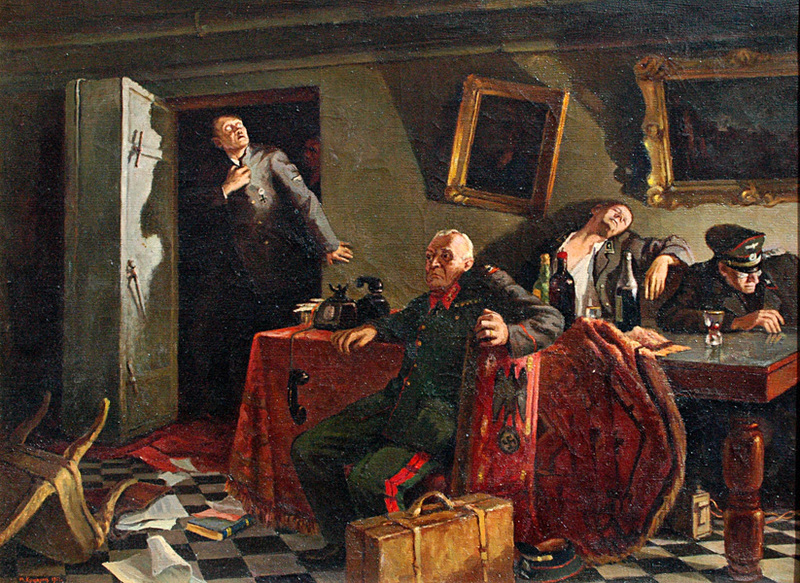 "The End (The last Hours in Hitler's Bunker)", oil on canvas, 67 x 89 cm, 1951.